Niagara Falls is one of those great vacation spots that can please everyone because it has a little bit of everything. Area locals know the best dining experience in Niagara Falls is at Coco’s. If your adventures bring you to the Fallsview Entertainment District then make a reservation beforehand and focus instead on the more difficult aspect of your trip –choosing between the different attractions the Niagara Falls area has to offer. If you are the adventurous kind, there are numerous hiking trails and boat tours to experience, if you are more laid back there’s museums, shopping and sightseeing and that’s just for starters. It doesn’t matter what type of vacation you’re looking for, Niagara Falls can deliver. If you’re looking for adventure, then Niagara Falls is certainly the place to be. Home of one of the world’s most beautiful waterfalls, the Horseshoe Falls is the most powerful Falls in North America with a vertical drop of more than 50 meters. Now wouldn’t it be amazing to see all that power up close? You can! Journey Behind the Falls and watch all 2,400 cubic meters per second fall from 13 stories above, in all its thunderous glory. Niagara Falls is the perfect place for nature lovers. If the majestic Falls isn’t enough to fill your camera card the area is surrounded by nature trails and hikes along the Bruce Trail. If nature isn’t your thing, then Niagara Falls has a number of other attractions that are perfect for your laid back personality. There are over 60 wineries within driving distance of the downtown core, many with their own tours. You can even find a number of tour companies that will pick you up at your hotel and organize tours of several wineries for you. Customize your tour or you can choose to go in large groups, or plan a romantic afternoon out with your significant other. Even if you don’t feel like leaving the city center there are dozens of things to keep you entertained, including Ripley’s Believe It or Not Museum, the Niagara Falls History Museum or Louis Tussaud’s Waxworks, as well as local waterparks and casinos. Regardless of what you do during the day, you’re guaranteed to work up an appetite. Where better to indulge than with fine dining options available steps from your hotel? Coco’s Terrace Bar & Grill offers a combination steakhouse, pizza bar and lounge as a haven for hungry travelers. 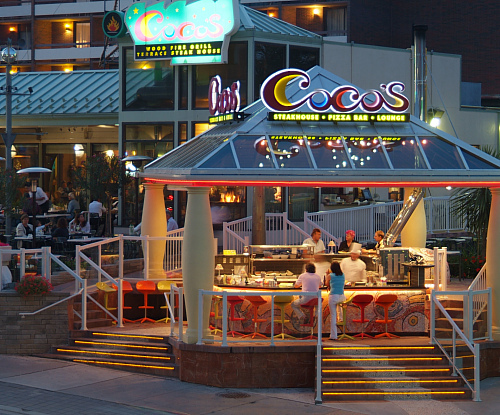 Whether you’re looking for a romantic dinner where you can watch a live show on our terrace under the stars, or need a filling breakfast to fuel your sightseeing, Coco’s is the popular breakfast, lunch and dinner choice for Niagara area tourists and residents. When local residents flock to a restaurant then you know it’s good, and Coco’s Terrace Steakhouse and Restaurant is a favourite choice for local Niagara residents, with Friday and Saturday night specials drawing in the crowds. Want to avoid a wait? Contact us now for a reservation and focus the rest of your energy on planning the details of your fun-filled Niagara adventure.